Muskoxen (Ovibos moschatus), more commonly referred to as muskox, were heavily hunted for their hides beginning as early as the 1860s. The value of a muskox hide lies in this animal’s adaptation to the extreme Arctic climate. They have developed coats with coarse outer hairs covering a layer of wool, generally known by its Inuktitut name ‘qiviut’, highly prized for knitting. A robe produced from the hide of a muskox is exceptionally warm and during winters in the late 1800s and early 1900s were much valued by people riding in sleighs and carriages. Muskox hides were traded at all Hudson’s Bay Company trading posts that were within a reasonable travel distance from the tundra. Fort Rae (map), on the North Arm of Great Slave Lake, was the centre of most of this trade. Hudson’s Bay Company records kept between 1860 and 1915 indicate that 17,485 muskox hides were traded at their posts in the Northwest Territories. This number does not include those hides traded at independent trading posts nor to Scottish or American whaling ships. The total trade in muskox hides, from 1860 to 1915, is estimated to be more than 22,000. In 1916 there were only four hundred to five hundred muskox in herds on the Arctic mainland. The muskox population for the Arctic islands was unknown at that time. With protective legislation enacted in 1917 the number of muskox slowly increased through to about 1960. Since then numbers have increased dramatically and by the early 1990s there were estimated to be as many as 17,000 on the Arctic mainland, more than 35,000 on Banks Island and about 25,000 on Victoria Island. 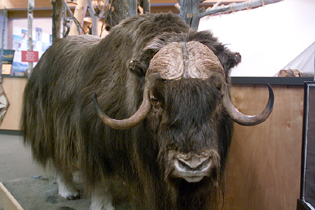 This mounted muskox is on display at the Prince of Wales Northern Heritage Centre (PWNHC Collection).